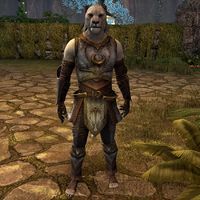 Adubaer-sa is a Khajiit warrior found in the city of Elden Root. He apparently is trying to choose whether to marry a High Elf or a Wood Elf. "This one is being pressured by his family to seek a mate from our political alliances. Abudaer-sa's quandary is the Wood Elves. They seem so lazy, and you cannot trust their cooking. But the High Elves are so ... tall. They are very tall, truly." "This one is thinking he could cope with a High Elf's height, but they are so often concerned with order and control. It doesn't feel right. Abudaer-sa cannot live in such chains, you know?" "This one has given much thought. If a Wood Elf mate were to insist on cooking Wood Elf foods, it would be all right. Maybe. If they are very small, though. Very small, indeed." This page was last modified on 28 May 2018, at 23:55.